1,880 pages - David Homer Bates papers & documents, correspondence, diary and journal entries, historical documents, photos, newspaper clippings, printed matter, and drafts and annotated proof sheets, from holdings in the Alfred Whital Stern Collection of Lincolniana in the Library of Congress. David Homer Bates (1843-1926), was a military telegrapher, author, and vice president of Western Union Telegraph Company. From 1861 to 1866 Bates was cipher operator and manager or the War Department's telegraph office. He wrote two books about his experiences in the telegraph office, Lincoln in the Telegraph Office (1907) and Lincoln Stories Told by Him in the Military Office in the War Department During the Civil War (1926). This collection includes material handwritten by President Abraham Lincoln. 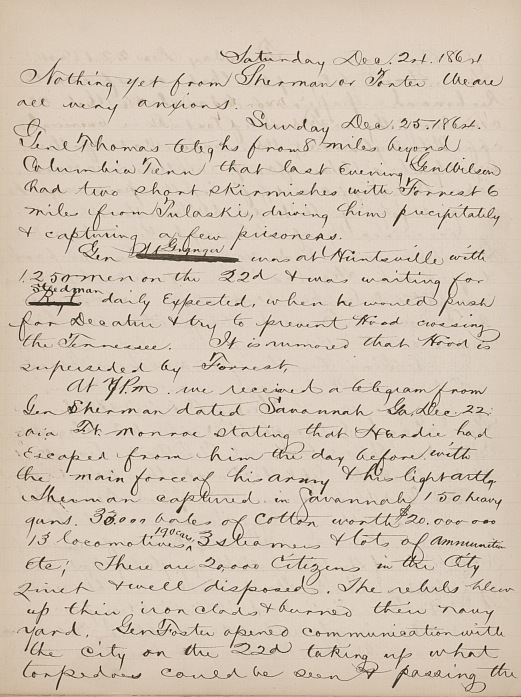 A key document is a day by day journal of Civil War events. Also of note are letters written by Civil War figures such as Confederate generals Robert E. Lee, James Lawson Kemper, Edmund Kirby Smith, Richard Stoddert Ewell, and Confederate president Jefferson C. Davis. The United States Military Telegraph Corps was established in 1861, soon after the start of the Civil War. Bates along with David Strouse, Samuel M. Brown, and Richard O'Brian left the Pennsylvania Railroad Company to help form the Telegraph Corps. During the war the Corps eventually had over 1,500 members and employees, constructing and maintaining 15,389 miles of telegraph lines. The Military Telegraph Corps employed civilian operators. Its supervisory personnel received military commissions in the Quartermaster Department so that they could disburse funds and property. Anson Stager, an official of the Western Union Telegraph Company, became its general manager. After President Lincoln took control of the nation's commercial telegraph lines in February 1862, they became available for use by Western Union. In March 1862, Secretary of War Edward Stanton decided that all telegraph traffic should be centralized in one place. The place chosen for the telegraph office was the War Department's old library next to Stanton's office. 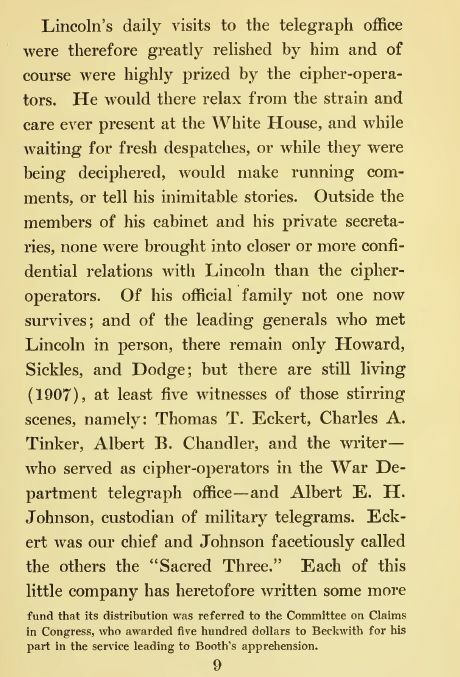 President Lincoln had to go to the Telegraph Office to send and receive messages. He often walked alone from the White House to the office. Lincoln welcomed going over to the telegraph office because it allowed him to have a break from the one-on-one demands placed upon him during the Civil War. He was able to use his time at the telegraph office for reflection without interruption. Lincoln wrote the first draft of the Emancipation Proclamation while at the Telegraph Office. David Homer Bates, wrote in his book "Lincoln in the Telegraph Office," that, "When in the telegraph office, Lincoln was most easy of access. He often talked with the cipher-operators, asking questions regarding the dispatches which we were translating from or into cipher, or which were filed in the order of receipt in the little drawer in our cipher-desk. Lincoln's habit was to go immediately to the drawer each time he came into our room, and read over the telegrams, beginning at the top, until he came to the one he had seen at his last previous visit." This collection of material dates from 1843 to 1926, composed of David Homer Bates personal papers. The documents include a diary, journal, correspondence, facsimiles, photographs, newspaper clippings, printed matter, and drafts and annotated proof sheets of some of Bates' writings. A diary and daily journal kept by Davis Homer Bates from November 1863 to June 1865. During this time period Bates was the manager of the War Department telegraph office in Washington. 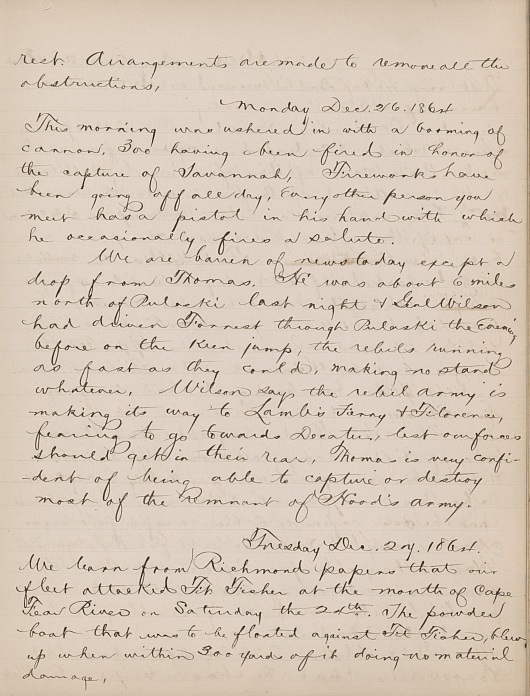 The entries in the diary and journal provide important information about military intelligence activities during the Civil War. This document provides a narrative, real time view of the telegraphic communications during the Civil War. Contains notes, letters, and endorsements of Abraham Lincoln, letters of Civil War commanders, and miscellaneous items. Includes letters from President Abraham Lincoln to Secretary of War Edwin M. Stanton. This section also includes letters written by Franklin Buchanan, Jefferson C. Davis, Jubal A. Early, Richard S. Ewell, James L. Kemper, E. Kirby-Smith, Robert E. Lee, Gideon J. Pillow, and Richard Taylor. Contains letters sent and received, mostly the correspondence of Bates with various individuals. Includes letters from Andrew Carnegie, General Thomas T. Eckert, Samuel Morse, and Robert Todd Lincoln. Includes some retained copies of letters written by David Homer Bates. This section contains reproductions of notes, letters, and other items of Abraham Lincoln, Confederate cipher codes, and miscellaneous material. Of special interest is a facsimile of Lincoln's estimate, in his own handwriting, of the Electoral Vote of 1864, made in the War Department's Telegraph Office on the evening of October 13th, 1864, three weeks prior to the Presidential Election. Also a facsimile of Confederate cipher code found among State Department archives in Richmond after its capture by General Grant in April, 1865. This code was used between President Davis, Secretary of State Judah P. Benjamin, and Secretary of Treasury, J. P. Meaminger, at Richmond, in their communications with Clement C. Clay and Jacob Thompson, Confederate agents in Canada, and with J. H. Cammack and other secret Confederate agents in New York City. The section contains articles, addresses, books, biographical material, photographs, and miscellaneous items. In this collection are scanned copies of two books written by Bates. President spent more of his waking hours in the War Department telegraph office than in any other place, except the White House. While in the telegraph office he was comparatively free from official cares, and therefore more apt to disclose his natural traits and disposition than elsewhere under other conditions." Charles T. White of the New York Herald-Tribune wrote of this book in 1926, "Another Lincoln book! The indexers have been saying it every year to the seemingly endless procession of Lincoln books, and the end is not yet! 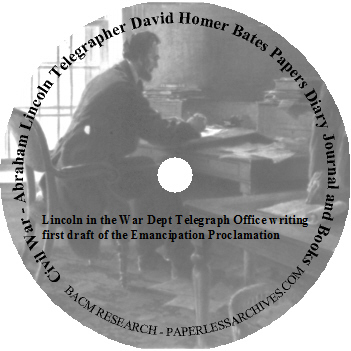 This time the entry is 'Lincoln's Stories Told by Him in the Military Telegraph Office,' recorded by one of the Listeners, David Homer Bates, and the book is a mate to 'Lincoln in the Telegraph Office,' which years ago established Mr. Bates with the reading public as an attractive writer and accurate historian. As this book, like its predecessor, derives its chief value from its authenticity..."
Out of touch with the North and living largely off the land, Major General Sherman and his Union forces kept President Lincoln in suspense regarding the success of this operation for thirty-two days. 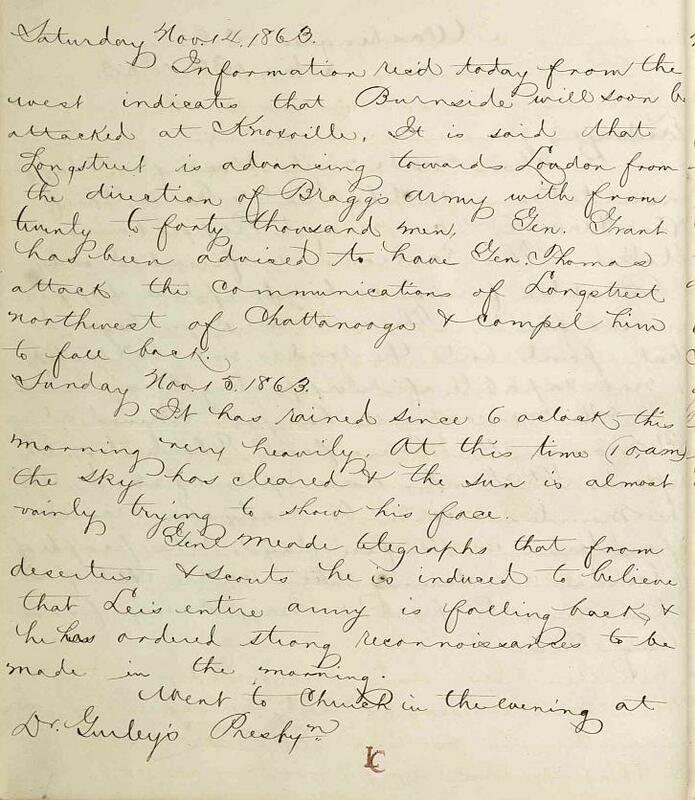 On December 22, 1864, Sherman relieved the president's anxiety, as this diary records above shows, and sparked renewed celebrations in the North with the telegraph message that Savannah had fallen. The diary was kept by David Homer Bates, manager of the Telegraph Office in the War Department during the Civil War. The entry Bates recorded for December 26, shows the jubilation in Washington, D.C., that greeted Sherman's news.